I definitely don’t do a lot of woodworking and I don’t claim to be a professional. I mainly like to do some woodwork on the weekends when I think of some projects, but it’s usually never anything serious. I decided to break down and buy a compact router to help make my life easier. After a lot of research, I went with the Dewalt DWP611PK Compact Router Combo Kit, and I couldn’t wait any longer to write a review on it. After just a few uses, it was evident that I would save a lot of time and frustration by having it. It is powerful enough with the 1.25 peak HP motor to do most little jobs that I have around the house. The size may fool you, because it is pretty small. But the small package packs a big punch! Who Should Buy the Dewalt DWP611PK Router? 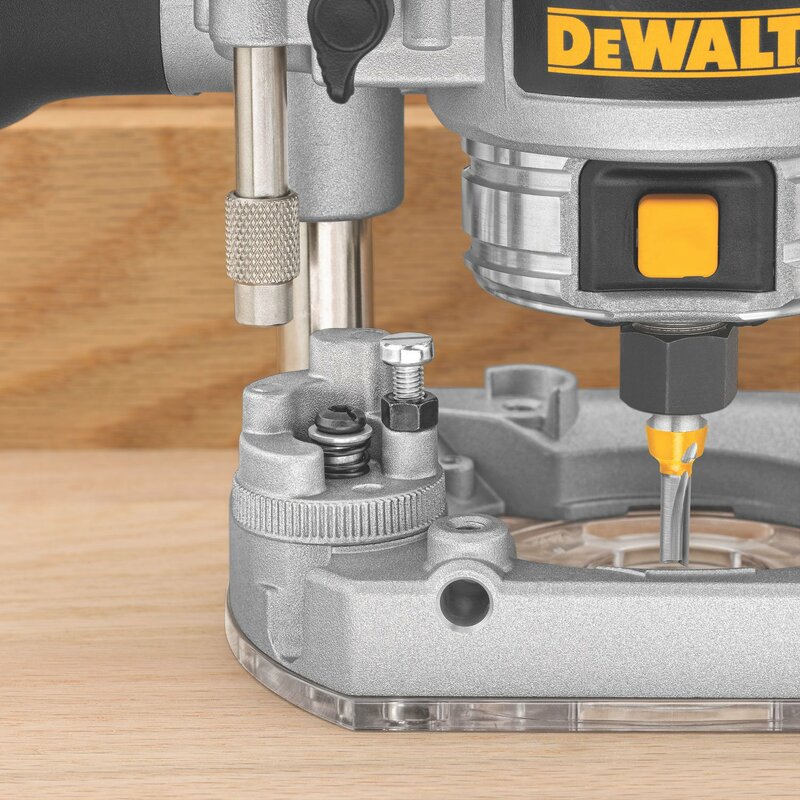 Not surprisingly, no router bits are supplied with the Dewalt DWP611PK Compact Router Combo Kit. And it’s also worth noting that it will only take ¼” shanks. It also comes with a standard fixed base, a plunge base, and a wrench and instruction manual. What I really like about this router is that it has powerful LED lights on it. I don’t have a lot of natural light in my shop, and sometimes it can be hard to do work with just my fluorescent lighting. The LED lights provide plenty of illumination to help me do any task efficiently and safely. My first impression when I took the Dewalt DWP611PK Router out of the box was that it was going to be too small to provide the power that I needed. As soon as I plugged it in and used it for the first time, I realized that this was exactly what I needed. A pretty neat feature is the soft start motor, which helps reduce the amount of stress on the router. The variable speed motor has six different settings with a range of 16,000-27,000 RPM’s. All you have to do is turn the dial to the speed you need for the project you are completing. I’ve noticed that the higher speeds work better with smaller diameter bits; and the lower speeds work better with larger diameter bits. For someone who just does small projects occasionally, I don’t believe I could have purchased a better router. It takes a little bit of time and effort to change out the bits, so I can see where that could be frustrating for people who do a lot of projects frequently. The one thing that I learned when using it is to take it slow and don’t rush. It has plenty horsepower to get most jobs done, so if you let the router do the work, then you will be more pleased with the outcome. The plunge versus fixed base is also something worth mentioning. The fixed base is amazing because it has a locking lever and an adjustment ring that will raise and lower the router to get to the perfect depth for your cuts. The plunge base works just as well, moves exceptionally smooth and produces clean cuts every time. It’s evident that Dewalt did a lot of research when manufacturing this product, because there aren’t many things that are left to be desired. Shopping for a woodworking router can be extremely difficult. Whether you are a professional woodworker or just do an occasional project, you want to get a router that is the most convenient and powerful to do the job. 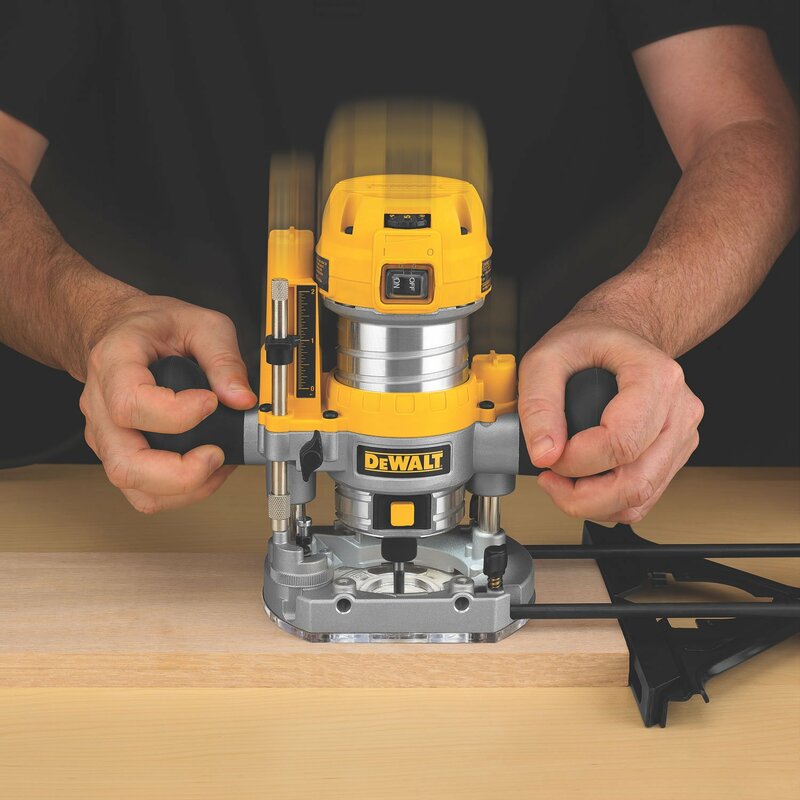 Unfortunately, sometimes that is too much to ask for, except when you have the Dewalt DWP611PK Router. For someone like me who is a recreational woodworker, this is the perfect router. It’s small enough so it won’t take up much space, and it’s powerful enough to do the small projects that you want to do. However, woodworking professionals can even find a use for it. Most professionals have a larger router that can be a pain to use for a smaller job. This compact router won’t take up much space in the shop and will come in handy when you least expect it! This router is designed for anyone who doesn’t do woodworking for a living, but still wants to have the equipment to do random projects. It is especially designed for people who haven’t used a router before. It is easy enough to use where you could sharpen your skills while using it. You can read the manual and instructional videos on how to use a router all you want, but there is nothing like the experience of using one! When you’re talking about the “perfect” tool, you’re looking for one that anyone can use regardless of their skill level and experience. It has an ergonomic design that will help you put your hands in the perfect position to make clean cuts. Essentially, the router will help you become an expert if you let it do the job rather than trying to force it. While the Dewalt DWP611PK Router comes with the basic accessories, it leaves you the option to add additional accessories once you hone your skills. The ability to extend your performance and learn new crafts is an attractive option that this router offers. After doing my own research on the Dewalt DWP611PK Router, I went on the faith of the reviews I read and invested in it. I can honestly say that all of the reviews that I read were completely accurate, and I would agree that this is arguably the best router available in its class. There are plenty of reasons why this is a best seller on market. For less than $200, you are getting a bargain because of the features it provides when compared to the price. So if you’re in the market for a new router, don’t delay in buying the Dewalt DWP611PK Router, because you aren’t going to find a better value!